A zany version of the classic Frankenstein told by a cast of pigs. The story takes place one Halloween night. 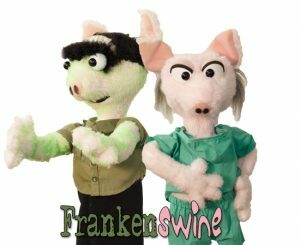 Doctor Frankenswine and his side-kick, Snout have created a Frankenswine monster by using nothing less than pork chops, bacon, and other assorted quality lunch meats. Dr. Frankenswine’s quest for a brain for his monster leads him to a loony madcap adventure with tons of Halloween silliness, confusion, and audience participation.